When the group of friends in Hannah Richell’s new novel, The Shadow Year, decided to put life on hold to live off the land in an abandoned cottage near the English moors, I was thrilled by the prospect. Though risky, because the college graduates were worried that the true owners of the homestead would appear and chase them off the lakeside land they believed they had taken for their own, their goal seemed reasonably attainable. One year. Four full seasons. I expected that food would be scarce and the cool seasons harsh, but what I was shocked to witness as I read, was the free-for-all that sent the entire system spiraling into collapse. More difficult to navigate than the wild terrain surrounding their wilderness home, less predictable than the weather that chilled to threaten their existence, human nature proved to be the source of chaos that ended the dream of utopian self-sufficiency the close-knit group of friends shared. 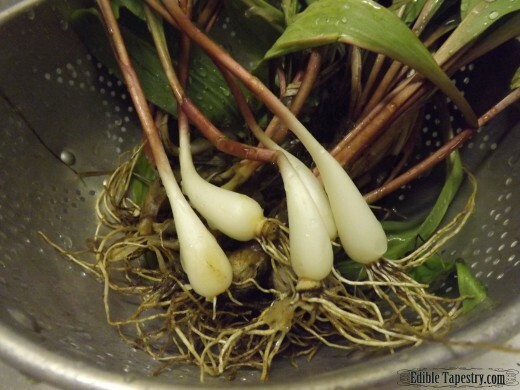 Ramps, or wild leeks are common to parts of the United States. After doing a little research, I learned that in parts of England, in “sunny, well-drained” places, wild leeks and garlic can grow. 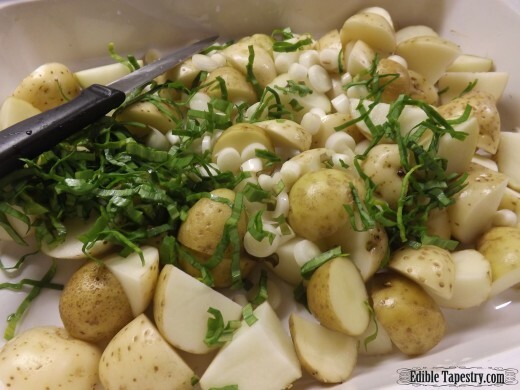 I decided to combine my local Appalachian ramps with new potatoes, that I believe Richell’s squatters could have grown in their cottage garden, and mushrooms (of the non-hallucinogenic variety) that could easily have been foraged from the surrounding woody places. A wood stove was all they had to cook with, but I believe roasting a pan of potatoes would have been easily accomplished in the little cottage. 3/4 lb. mushrooms. 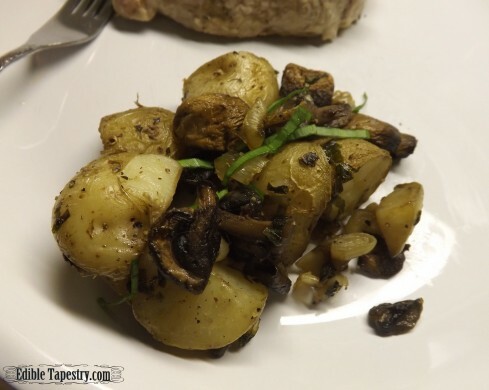 I used white button because they are readily available, but forest mushrooms, such as morels or chanterelles, would be amazing in this dish, and more authentic to the story. 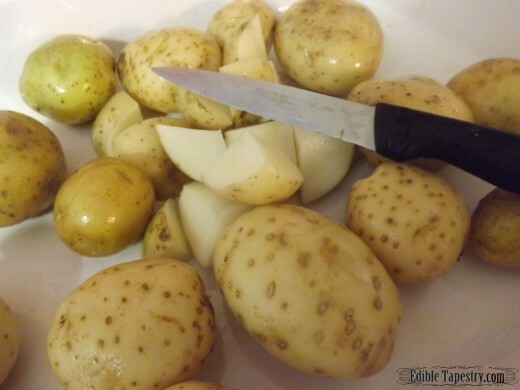 Quarter or halve the potatoes, depending on their size, to bite sized pieces. Place in a 9X13″ baking pan. Clean the leeks, peeling the outer layer off and trimming away the roots. Trim wilted ends from the greens. Slice them. 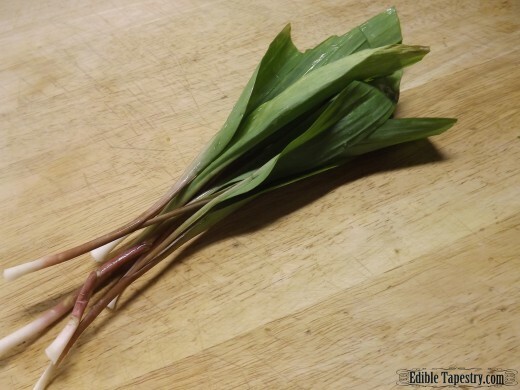 I include the tender greens of ramps, though most people discard them. Add them to the potatoes. 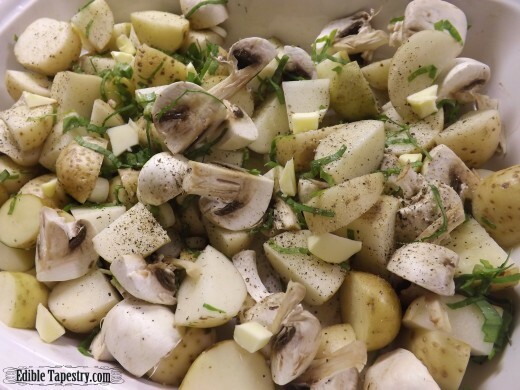 Quarter the mushrooms and combine them with the potatoes and leeks. Roast for 1 to 1 1/2 hours, or until tender and browned. 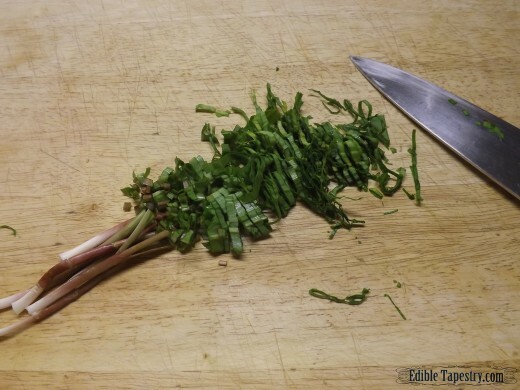 Garnish with fresh leek greens, chiffonade. This is amazing! I am so honoured you’ve taken the time to create something inspired by my novel. And it looks so yummy. My day is MADE. Thank you, Ingrid @EdibleTapestry.